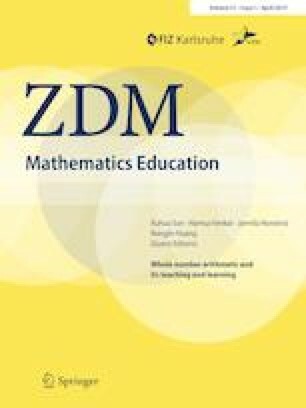 This study investigates the teaching and learning of single-digit whole number multiplication in China. Analysis of data from documents, classroom teaching, and semi-structured interviews revealed three salient characteristics of emphasizing oral calculation, calculation speed, and understanding across standards, textbook and classroom practices. It also showed how mathematics teachers enact these features in their teaching practice to help students develop their computational skills. The study particularly elaborates the role played by the nine-times table, or Chengfa Kou Jue Table (CKJ Table) in teaching practices, as well as how teachers treat memorization of CKJ and how understanding of operations contributes to their better understanding the relationship between the two in the teaching process. Kahn, V. E. (2005). A scenario method of teaching multiplication and division concepts. US20050089830 A1. http://www.freepatentsonline.com/y2005/0089830.html. Accessed 10 Sept 2018.